Broadwindsor Community Stores is celebrating after winning an award from the Dorset Volunteers Centre. The shop, which opened in spring 2013, has 50 volunteers who support manager Steve Jarvis and his assistant, Jane Sloman. The shop was nominated in the Dorset Volunteers Centre’s Volunteer Group of the Year category. 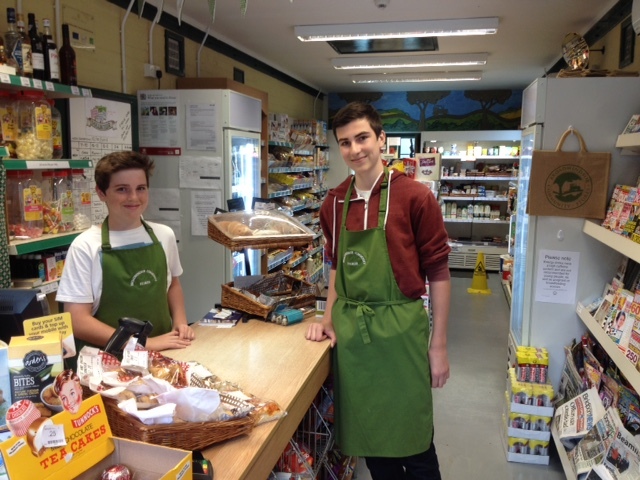 Among the shop’s volunteers are three young people doing their Duke of Edinburgh award. Teenagers Joe and Michael O’Hagan (pictured) and Grace Reeder can regularly be found behind the counter at weekends. A young resident who lives in a house run by Autism Wessex also volunteers at the shop. Mr Hughes said more and more customers were using the stores to do their weekly shop because the prices gave value for money without people having to travel very far. “We’re seeing a lot more people we haven’t seen before, as word about us spreads,” he says. The shop has introduced a number of new lines and also new services. The latest includes the Amazon Pass My Parcel delivery service in which Amazon customers can select to have their packages delivered to the shop. Broadwindsor Community Stores also offers Pay Point, which allows customers to pay utility bills and top up their gas and electric. People can also buy their TV licence at the shop. In the lead-up to Christmas, there will be a ‘Shop Up’ event at Broadwindsor Comrades Hall on Saturday 21 November There will be hot food tasters from E @ Tangs Chinese Takeaway, a new line the shop will be carrying, and other local suppliers, as well as tea, coffee and mulled wine. This will be a cash-only event as the hall does not have card payment facilities. “Broadwindsor Community Stores is a shop with something for everyone,” Mr Hughes said. Superfast broadband is now available in Broadwindsor and Drimpton!